Some grooms want to spend their bachelor party sipping bourbon, smoking cigars, and looking at naked ladies. Other grooms want to be under the big sky, challenging themselves to get to the top of a stone cliff using nothing but their muscles, their wits, and the odd piton. 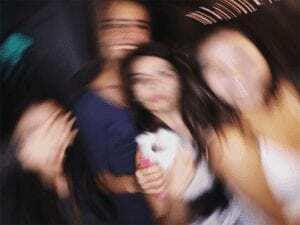 If you’re the type of guy who drinks Kombucha, still wears a Live Strong bracelet, and owns a portable tent, you’re going to want to know about the bachelor party destinations below. They offer some of the best spots to live on the edge–before jumping off into a mountain pool 60 feet below. 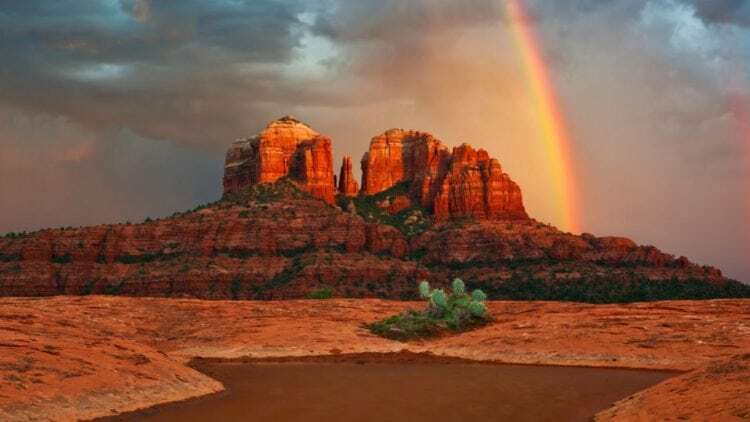 If your entire bachelor party group skews outdoorsy, head to Sedona. Not only can you hike more than a 100 challenging trails, you can rock climb and also scramble without rope, like at Cathedral Rock, a natural landmark with rising spires and towering monoliths. The ascent is quite steep (there are some toeholds) so you’re definitely getting your work out for the day. Less experienced hikers should stick to the eastern trail, but anyway you go you’ll experience some incredible views. Recover by heading to Grasshopper Point, where you can cliff jump some 40 feet into the deepest part of Oak Creek. Welcome to the school of hard rocks. Utah has the best rock climbing in the US, period. If you don’t run into other rock climbing groups, then you definitely took a wrong turn in, like, Idaho (which does have climbs, but not as ubiquitous or good as Utah). 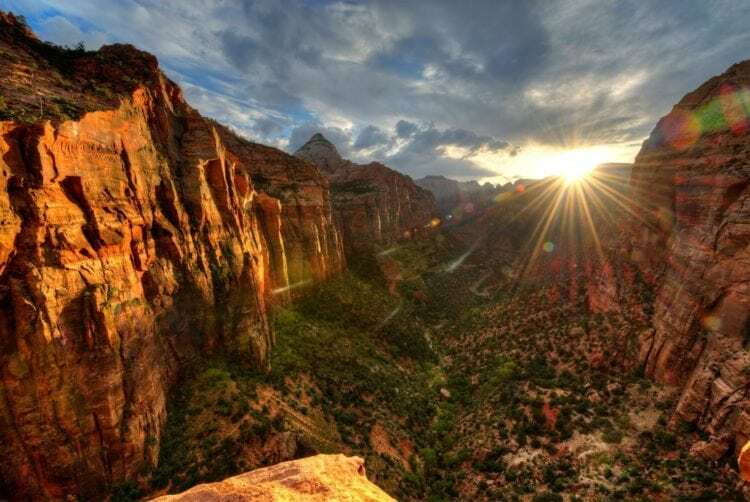 Get all Vertical Limit and Cliffhanger at Zion National Park, with 2,000-foot sandstone wall climbs (experienced only); Arches National Park, with unbelievable views of sprawling, flat land; and Capitol Reef National Park, with arches and bridges and some impressive prehistoric rock structures. There are two reasons Reno, Nevada is on this list. One: Whitney Peak Hotel, where you’re staying, has a 164-foot rock climbing wall that takes up an entire side of the building. At 164 feet, it’s the world’s tallest artificial rock wall for both beginners and advanced climbers (it’s a Guinness Book of World Records holder). There’s also a 7,000 square-foot indoor bouldering park. 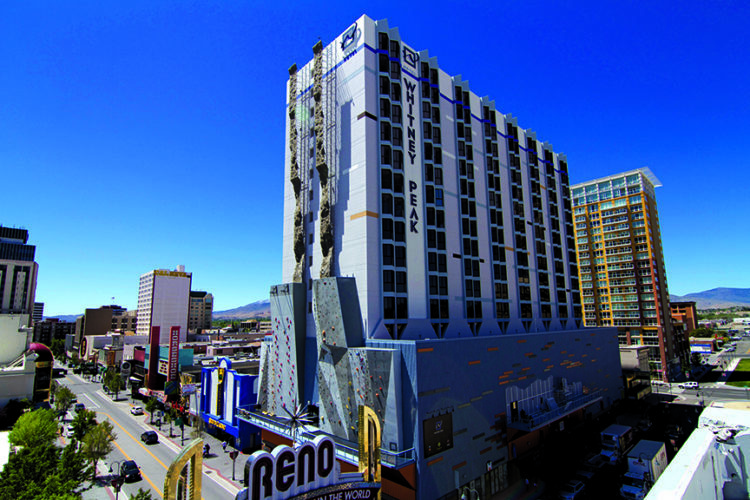 Two: Unlike other rock climbing spots, you can still get your debauchery on at the bars, clubs and casinos in Reno. 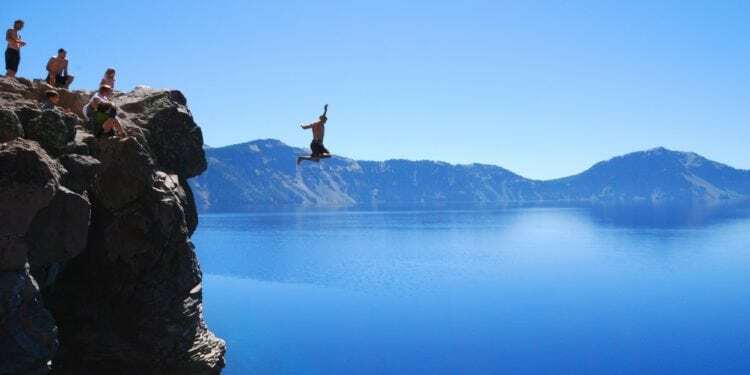 Three: Reno is an hour away from Lake Tahoe, where you can get on a boat, fish and do more rock climbing at Lover’s Leap. 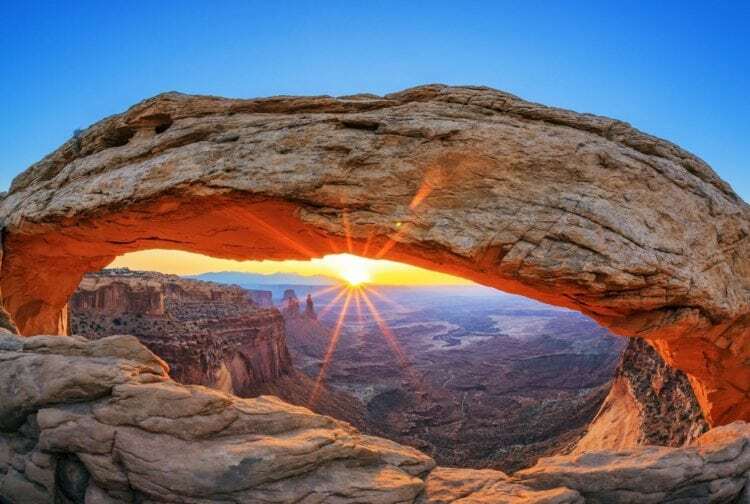 Base yourself in Denver, one of the best bachelor party cities out west and the capital of one of America’s best states for rock climbing. You can take a short drive to Boulder, which is known for awesome rock climbing, and you can even do group tours. Or you can take a road trip out to Black Canyon, which is a magnet to advanced climbers, especially the most remote areas near North and South Chasm Walls. Colorado National Monument is Disneyland for climbers, with 150 routes on sandstone cliffs. 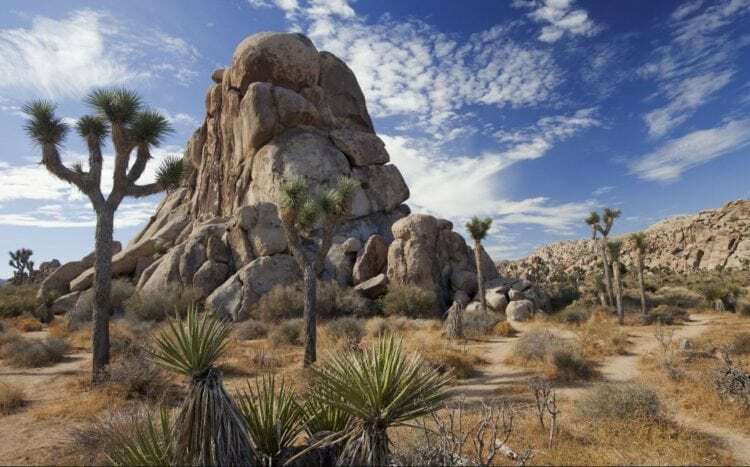 Just outside Palm Springs, Joshua Tree National Park is a haven for climbers, with more than 8,000 climbing routes. This is perfect for those who are tagging on more days before or after their Coachella- or StageCoach- themed bachelor party. Joshua Tree definitely attracts more of a hipster/millennial crowd, but they’ll surprise you when they put down their guitars and PBRs and start climbing the rocks like Spiderman. When going to Los Angeles, you’ll want to carve out some time in Santa Monica State Park, home to Malibu Creek in Calabasas (the area where celebrities like the Kardashians live). You’ll find a motherlode of cliff jumpers here, where diving drops range from 15-70 feet into 12 feet deep pools. 70 feet is high, but if that’s how you roll, you can also head to Gilligan’s Island, another 70-foot spot, about two hours east of LA. 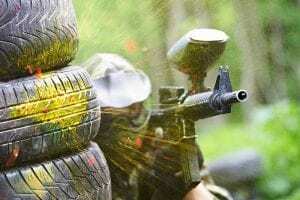 Tons of bachelor party groups head to Big Island, for all the sites and activities we’ve outlined elsewhere. 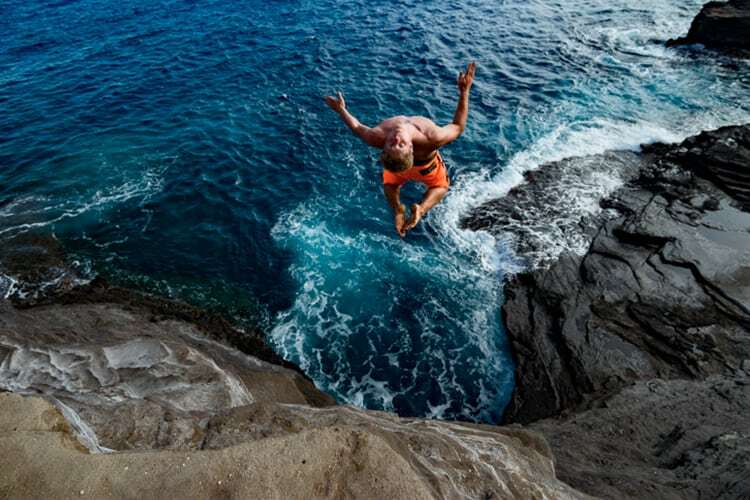 But if cliff jumping is where you find your bliss, head to the southernmost tip of the island for one of the best cliff jumping spots in the world. The rugged cliffs offer a sheer drop into the Pacific Ocean, some 45 feet above. It’s a popular (and safe) spot (there’s even a ladder to help you get back to the top). Rock climbing is a thing in Hawaii, so expect to harness up. None of the spots we’ve outlined are too extreme–until now. 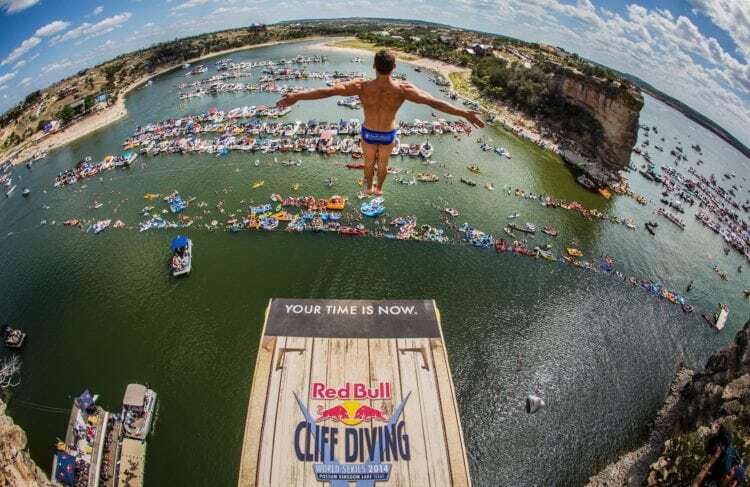 About 80 miles west of Forth Worth, Hell’s Gate at Possum Kingdom Lake is so crazy that Red Bull picked it as one of the locations for its Cliff Diving World Series, mainly for the sheer 90-feet cliffs. Hell’s Gate is not a place to participate in cliff jumping (in facts, it’s illegal). But if you happen to be in the area during an authorized jumping event, it’s worthwhile to rent a boat and go watch the action. 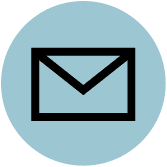 This is an opportunity for some vicarious thrills: leave the actual jumping to the professionals.